The Nation gave Thompson his first big break in journalism in 1965. 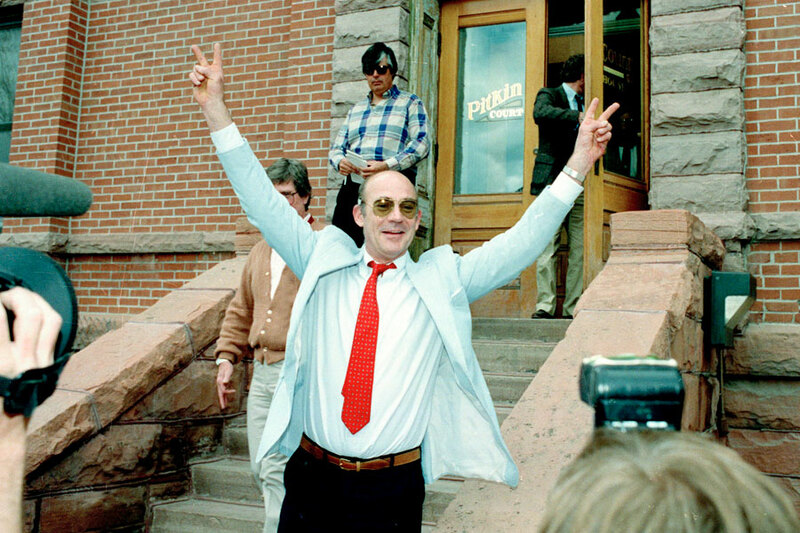 The Nation’s editor Carey McWilliams—whose involuntary participation in the internment of the Japanese was discussed in yesterday’s Almanac entry—gave Hunter S. Thompson, who died ten years ago today, his first break in national journalism. In 1965, McWililams asked Thompson to read and report on the Hell’s Angels, whose exploits had just attracted the attention of the state’s attorney general. The publication of that article led to his first book deal. The following obituary of Thompson (March 21, 2005) was written by Warren Hinckle, editor of Ramparts in the late 1960s. Hunter was one of the sanest men I have known…and his larger-than-life persona as part of the story was his way of shattering what he considered the myth of objectivity in journalism. He thought all media were biased, protected by layers of cautious corporate camouflage pretending to objectivity, and the only way a writer could express his well-founded political likes and dislikes was to break the mold of objective journalism and go for the wild thing; then editors treated you differently because they were either afraid or fascinated by you. You had to be, in a way, bigger than the story to be able to tell the story, which in Hunter’s case was the raw truth as the writer saw it. A television journo asked me if Hunter had “forged a new path” in journalism. I thought about it and said no, he had, rather, beaten his way back through the overgrown jungle of bureaucratic media to the original path of nineteenth-century journalism, when journalism was actually a popular, participatory sport, and editors swore openly and imbibed freely and spat tobacco and carried guns and cussedly attacked politicians and other editors by name as varmints unworthy of becoming roadkill…. Hunter’s personal style of journalism blew a hole in the tin can of the profession and let in some welcome air. He has inspired a new generation of young journalists-to-be who have been less than called to a profession assuming the dull armor of accounting.